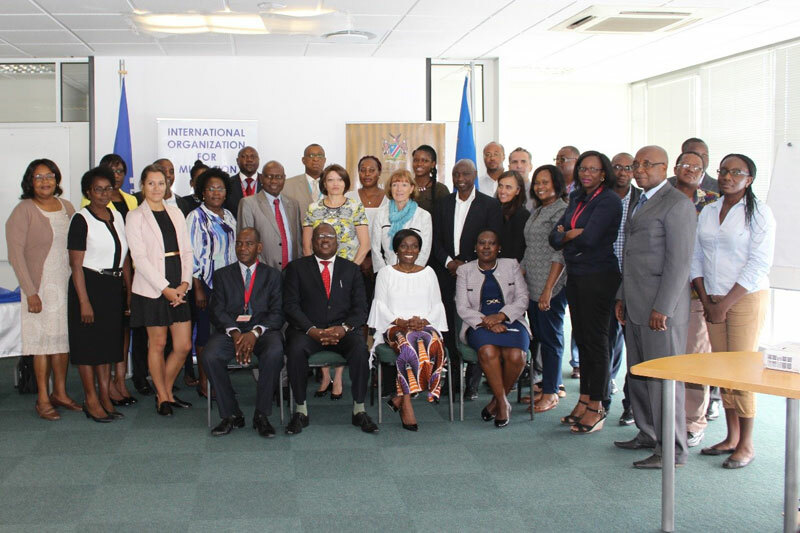 Namibia - IOM and Namibia’s Ministry of Environment and Tourism (MET) launched a project on migration, environment and climate change this week (14/03). The launch was followed the next day by a capacity building workshop on the relationship between migration, environment and climate change (MECC). The project’s launch was attended by more than 40 participants from key governmental and non-governmental stakeholders, as well as by representatives of the wider UN family in Namibia. Key speakers during the launch included the Environmental Commissioner, the Chair of the UN’s Emergency and Humanitarian Focal Points in Namibia on behalf of the United Nations Resident Coordinator, the Director of Border Management and Immigration in the Ministry of Home Affairs and Immigration, the Director for Disaster Risk Management in the Office of the Prime Minister as well as Representatives from IOM Geneva, Pretoria and Windhoek. Dr. Babagana Ahmadu, Chair of the UN’s Emergency and Humanitarian Focal Points, pointed out that environment and migration featured high on the agenda of the 2015 Paris Climate Change Conference and that the issue was addressed by several other international and national frameworks such as the Sendai Framework for Disaster Risk Reduction 2015-2030, a non-binding agreement that recognizes that the State has the primary role in reducing disaster risk. Teofilus Nghitila, Namibia’s Environmental Commissioner added that in Namibia, the urban population makes up 50 percent of the total population. This is not only due to the lack of economic opportunities in rural areas, but also to the fact that many people move to the cities following recurrent drought and floods. He also said the project comes at the right time, as it will help deepen understanding of the impact environmental challenges have on human mobility. The capacity-building workshop sought to address the relationship between migration and environmental change, including climate change. It also served as a platform for the partners to discuss and share expertise on the realities and challenges of MECC, including how the evidence gap on the subject could be addressed. Southern Africa and the Indian Ocean region have been adversely affected by climate change in recent years. In Namibia, the impact of the recent drought has made communities more vulnerable to food insecurity, putting the livelihoods of many families at risk and heightening the possibility of relocation to urban areas. In Madagascar, many people were forced to move when their crops and livelihoods were destroyed by recurrent droughts in 2016, while recent floods in Mozambique caused the displacement of hundreds of people. Similar capacity building workshops and research initiatives are underway in Madagascar, Mauritius and Mozambique. These initiatives are part of the wider IOM Development Fund (IDF) supported project Migration, Environment and Climate Change: Evidence for Policy in Southern Africa and the Indian Ocean, which aims to increase knowledge and awareness about the relationship between migration and environmental change in order to inform related policy and operational planning at both the regional and national level.